Acrylic varnish of gloss finish, ideal for homogenizing with the non-fading, metallic styling powders, LUSSO D’ORO. Extra durable and long lasting; it creates a strong, water and oil proof protective film that does not peel nor yellow over time. Offers a unique aesthetic effect over marble and gypsum based plasters, drywall, cement board, as well as MDF and chipboard. Decorates and protects walls, coated with emulsion or acrylic paints as well as unpainted wall surfaces. 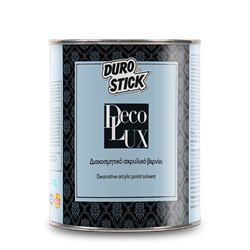 Apply two coats of the styling system DECOLUX together with LUSSO D’ORO to coordinate and fit perfectly wood doors, cabinets and elements coated with enamel paints or varnishes within both modern and classical spaces. Transform ceramic or cement statues and planters (big and small), by altering their aesthetic form and value, adding permanent shades of gold, silver or copper, resistant to the passage of time. 1lt/5-8m², on properly prepared surfaces, depending on their absorbency.